AUSTIN — Beto O’Rourke’s weeks of near-silence end on a massive stage when he sits down for an interview with Oprah Winfrey. The appearance Tuesday on “Oprah’s SuperSoul Conversations from Times Square” comes ahead of a possible presidential campaign and puts O’Rourke’s charisma to the test. O’Rourke dazzled Democrats last year by nearly defeating Republican Sen. Ted Cruz in the country’s largest red state. But his presidential prospects have been overshadowed more recently with the generally well-received 2020 campaign launches of Sens. Kamala Harris of California, Elizabeth Warren of Massachusetts and Cory Booker of New Jersey. After months of on-again off-again flirtation with a campaign, O’Rourke’s supporters say they’re ready for some clarity. Lerner may not even get that much, though. O’Rourke’s aides say he is still making up his mind on a White House run and isn’t expected to announce a decision during Tuesday’s taping. Still, his association with Winfrey could be helpful if O’Rourke decides to pursue a campaign. Winfrey’s endorsement of Barack Obama was pivotal to his 2008 campaign. She also took the rare step of campaigning for Democrat Stacey Abrams ahead of her near-upset in the Georgia governor’s race. Winfrey herself has been the center of 2020 speculation, though she has said she doesn’t plan to run. Her show blurs the line between politics and pop culture. The lineup on Tuesday also features actors Bradley Cooper and Michael B. Jordan and philanthropist Melinda Gates, underscoring the sense of celebrity that surrounds O’Rourke. The taping comes amid the fallout of a racist photo on Virginia Gov. Ralph Northam’s medical school yearbook page. While all of the declared Democratic presidential candidates have demanded Northam’s resignation, O’Rourke hasn’t commented. That may change if he’s pressed by Winfrey. O’Rourke’s low profile in recent weeks has taken curious turns. He treated Instagram followers to a glimpse inside his mouth during a teeth cleaning while trying to decry the Trump administration’s border wall. He also recently traveled in Texas, New Mexico, Oklahoma, Kansas and Colorado, but his meandering online posts documenting the journey highlighted things like the open-face roast beef sandwich he had for lunch rather than offering hints about how he’d handle the rigors of a presidential campaign. 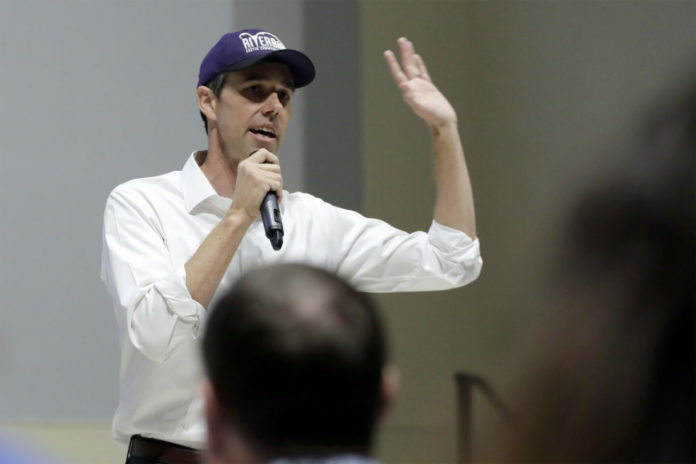 O’Rourke’s camp points to his rejection of politics-as-usual — including shunning donations from outside political groups as well as consultants and pollsters while nearly knocking off Cruz — as proof that not following the 2020 pack can pay off. Though the taping is Tuesday, the interview won’t air on Winfrey’s network until Feb. 16. After that, O’Rourke doesn’t have another headline-grabbing event on his schedule — at least not yet.